I WATCHED the dreadful events of September 11, 2001 with horror. The evil acts of 19 men changed our world. Their hate led to wars in which thousands more lost their lives. A man who is not afraid to die cannot be threatened – he has to be won over. Violence won’t change the present state of anger and arrogance, hopelessness, frustration and fear. Neither will it bring justice, freedom and peace. 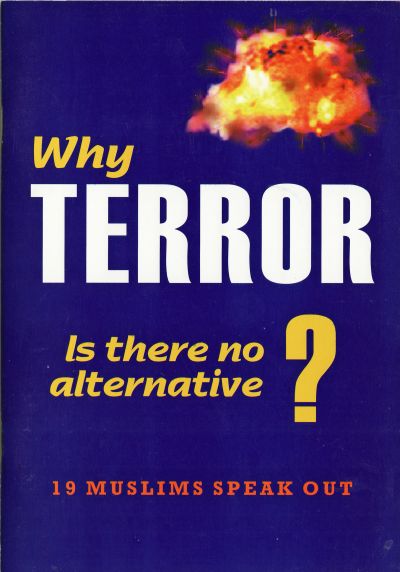 I am thankful to the 19 who appear in this booklet for their courage in facing their own prejudices, fears and hatred. Islam condemns all forms of terror, killing without due process of law, injustice, corruption, tyranny and oppression. There is no justification for the use of terms such as ‘Islamic terrorists’. But as a Muslim I must be aware of deeds by other Muslims in the name of Islam. I feel ashamed when I hear that they are breaking the Law of Islam. I sincerely apologise to those who have suffered from senseless actions of so-called Muslims. I strongly believe that fighting terror with bombs and bullets only plays into the hands of the terrorists. Being tough on the causes of this evil act is as important as identifying the terrorists themselves. We must pray to overcome our own arrogance, hatred and bitterness.